Does your child do homework while engaged in online distractions? Is your child frequently interrupted by text messages while doing work? Does your child believe that that he or she can effectively multitask while studying? If you answered yes to one or more of these questions, your child may benefit from our student guide to cutting homework time in half. 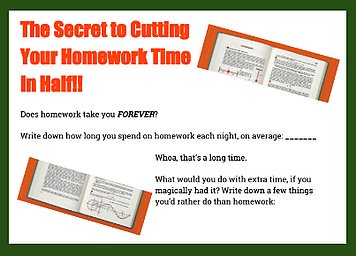 This how-to guide is written for the student who is tired of spending long hours on homework, but is not aware of his or her inefficient work habits.